We’ve used our Street View technology to bring you new 360-degree imagery of the animals, attractions and surrounds of Taronga Zoo and Luna Park in Google Maps. This imagery covers almost everywhere in Taronga Zoo (as long as it’s wheelchair accessible) - including chimpanzees, giraffes and mountain goats. We also released new imagery of Luna Park that includes a walk down the central boulevard of Luna Park featuring the ferris wheel, merry-go-round, big top and Coney Island. And, just in case you’re dreaming of a winter wonderland this Christmas, from today you can now check out fresh new imagery from the Arctic! To get a sense of what it’s like to live up in the north, you can walk down Omingmak Street, make your way the bridge (where locals fish for Arctic Char) and head out to the Old Stone Church. Check out some Arctic souvenirs in the Arctic Closet, or visit the Ice Hockey and Curling Arena. Over the last few years, the Street View team has gotten creative about how they collect cool imagery in difficult to reach places. We’ve used trikes (Stonehenge, The Amazon), trolleys (museums and galleries, NASA), snowmobiles (Whistler), the backpack Trekker (Grand Canyon coming soon), and underwater cameras (Great Barrier Reef) to capture some of the world’s most remote scenery — as well as wonders closer to home. So...what’s next? Now with Photosphere, users from anywhere on the globe can take their own 360-degree panoramas and upload them directly to Google Maps to share them with other people all around the world. So bring out the Captain Cook within you and jump on Street View to explore your world. As of this week, you can visit now Taronga Zoo and Luna Park... without even leaving your house. This year, Goyte’s musical sensation Somebody that I used to know has been viewed over 339 million times on YouTube, and that doesn’t include spin-offs and fan-uploaded videos that have been viewed over 260 million times. This group of five people on one guitar, and Wally’s own YouTube orchestra are two of our favourites. To have your say, visit the official ARIA YouTube channel where you can watch all of the videos nominated for an ARIA this year, including the ten up for Best Video. Simply cast a thumbs up for who you think should win, and be sure to subscribe to the channel to find out who wins. Great Barrier Reef, covers 344,400 square kilometres. That number is hard to make sense of - until you realise it’s actually bigger than the entire land mass of New Zealand. That makes the coral degradation the reef is currently suffering a big, big challenge. Google Earth Outreach is one of the most useful programs that scientists and nonprofits can access to learn how to leverage Google mapping tools to help people understand the scale of environmental issues. It has been used from the Amazon to the Appalachian mountain tops to convey complex environmental and social issues over time. We’re hosting a special event for Australian nonprofits to learn more about the Google Earth Outreach program at Macquarie University on Monday, November 5. There will be a keynote address by eminent Australian scientist Tim Flannery, and we’ll also hear from nonprofits who are using Google Earth and Google Maps around Australia. If you’d like to attend Monday’s event in person, please RSVP here. And if you can’t attend in person, you can join in via our Google Australia +page from 6:30pm EST. In a country as large as Australia, environmental issues can be difficult to comprehend, let alone combat. For example, one of our most precious natural treasures, the Great Barrier Reef, covers 344,400 square kilometres. That number is hard to make sense of - until you realise it’s actually bigger than the entire land mass of New Zealand. That makes the coral degradation the reef is currently suffering a big, big challenge. To celebrate the guys who are man enough to take this on we’re launching Movember Games - a Chrome app to accompany you on your hairy journey. It’s a series of four mo-tion sensing games released over the month to train your moustache for greatness. Each week we’ll launch a new game to challenge your Mo and develop its strength and dexterity. 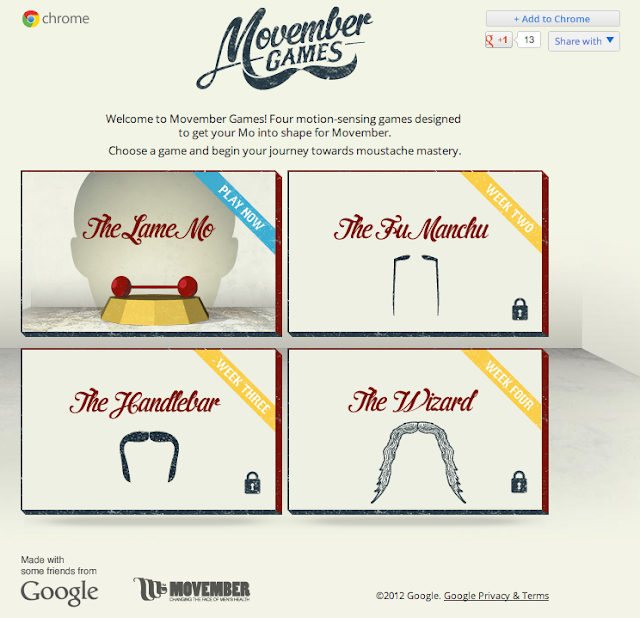 The app is available in the Chrome Web Store or you can play in Chrome at movembergames.com. Chrome is a modern browser that can handle the technology used to make web games with ease, so you’ll have the best experience playing with the motion sensing technology in Chrome. I’ve registered at movember.com and am ready for the challenge! Your Lame Mo might spark a taunt or two right now, but we invite you to rise above the jeers and master your moustache. We believe your top lip is destined for greatness.